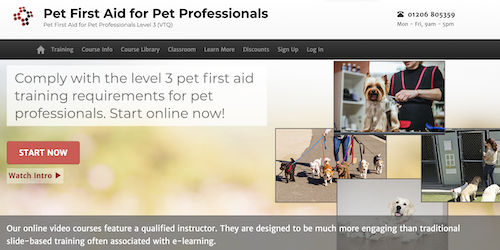 Our popular pet course range has a new addition…Pet First Aid for Pet Professionals Level 3! This advanced course covers a variety of animal injuries and illnesses in much more detail, with a focus on dogs and cats. It’ll teach you the art of early detection, and show you how to give the appropriate care. The course meets the latest government and council guidance, as a level 3 ‘VTQ’ qualification. The course covers things like the anatomy and physiology of animals, and different first aid treatments available. Although treatment is very similar between dogs and cats, this advanced course has a whole section dedicated to our feline friends. Online – A six-hour video learning course. Learn at your own convenience; pick up and learn whenever suits, starting and stopping the course as required. As you’re able to switch between multiple mobile devices, you can really learn on the move. Like it says on the tin, our online course doesn’t come with any classroom time, but you can book an additional practical module locally with one of our approved instructors if you want to extend your learning experience and practise what the online course has taught you. Blended – A mixture of online and classroom training, this course includes an online and practical module. Once you’ve finished the self-study e-learning, an approved instructor will cover practical subjects with you, enabling you to gain the full qualification certificate. This qualification is also available with an ‘Endorsed Certificate’ from TQUK, for an extra charge.